For the love of soup; even as the days get warmer and spring is knocking on the door there is still room for soup on the menu. Soup is one of the best ways to boost your nutrition, here are my top five super-healthy and delicious vegan or vegetarian recipes. 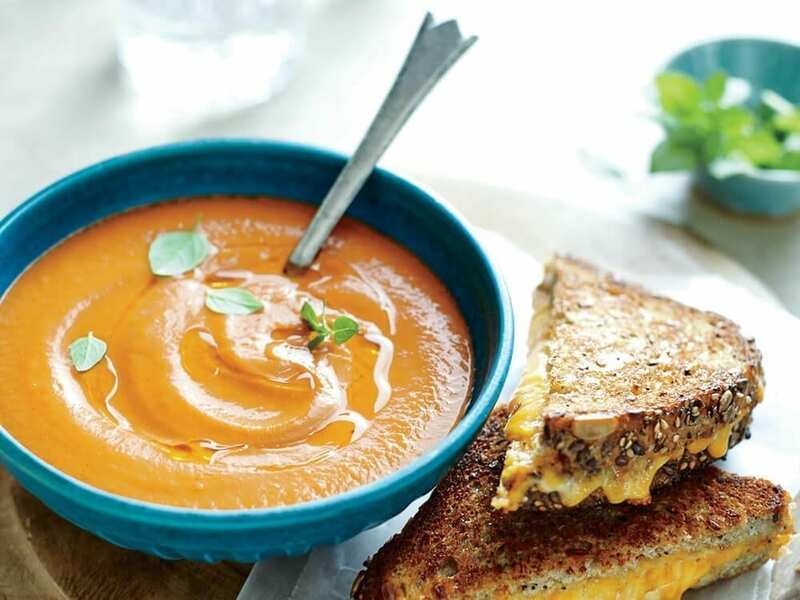 Soup is a fantastic and simple way to introduce more plant-based whole foods into your diet as it is one of the healthiest ways to get a good dose of vitamins and minerals. Contrary to popular fears you are not totally destroying the nutrients in the vegetables by boiling them as a good percentage of the goodness remains in the broth. The following is a range of my favourite recipes which are great served with select breads: flat breads, rye or whole grain for a wholesome and filling lunch or dinner. 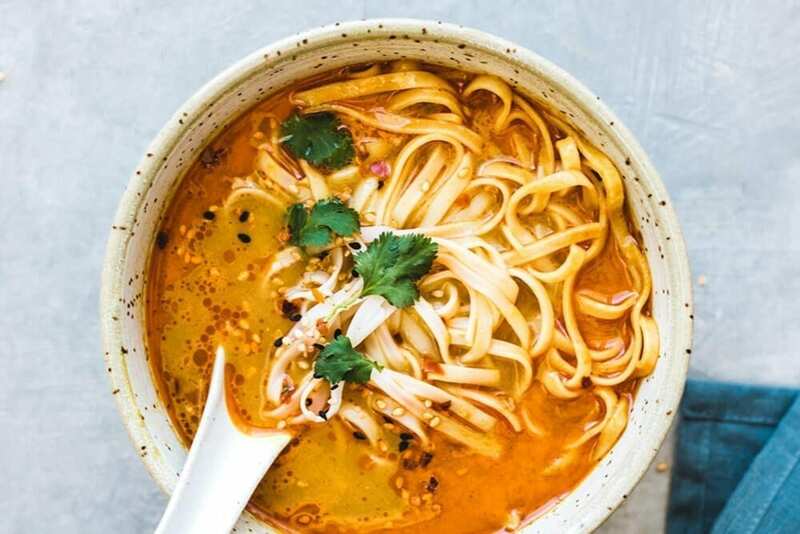 This Northern-style vegan Thai coconut soup is a take on one of my favourite Thai soups: Khao Soi. This version is made vegan and gluten-free by using vegetable broth and replacing the traditional egg noodles with rice noodles. by Jess at Choosing Chia. Add the onion and cook on medium heat for 2-3 minutes until translucent. Next, add the garlic and ginger and cook for another minute. Add the Thai red curry paste, curry powder, turmeric powder, vegetable broth, and coconut milk. Bring to a boil stirring everything together, then lower the heat to medium-low and let simmer for 5 minutes. Next add in the soy sauce, coconut sugar, and lime juice and stir together. Reduce heat to low and let the soup simmer for another 5 minutes. While the soup is simmering, cook the rice noodles according to package directions. Add the rice noodles to the soup. Serve with fresh coriander and a lime wedge. Some brands of Thai curry paste are spicier than others. I’d recommend starting with 1 tbsp and then adding more as needed to your taste. Or, be brave and make your own, once you have done it once you’ll never look back (and you’ll have all the ingredients!). 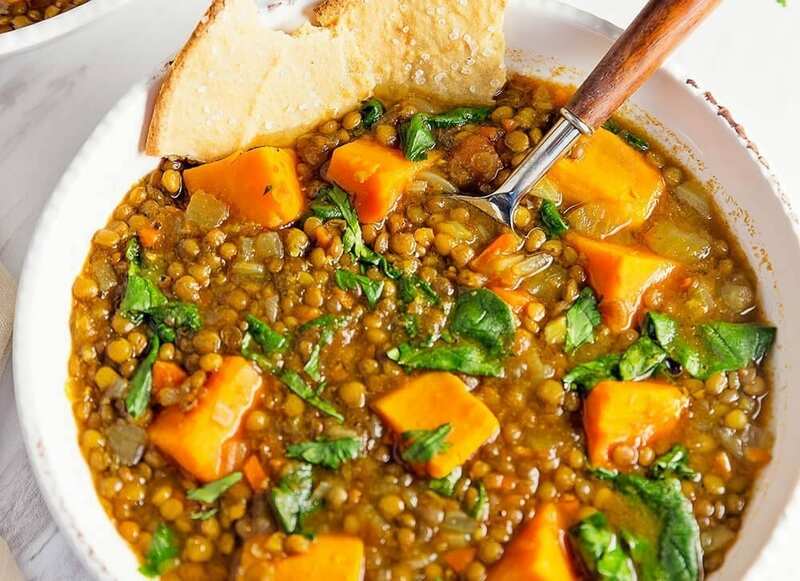 A soul-warming Moroccan sweet potato lentil soup recipe. This soup is made in the slow cooker and requires hardly any work at all. If you don’t have a slow cooker, you can make it carefully on the stove on a low heat. Place the sweet potatoes, carrots, onions, celery, red bell pepper, garlic, lentils, spices, and 6 cups of broth into a slow cooker. Cover and cook on the low setting for 6-8 hours or on high for 4-6 hours. Check the lentils for doneness. If you’re lentils have been in the pantry for a while, note that they’ll take a bit longer to cook through. Place half the soup into a blender along with a little additional broth (½ cup or so) and blend till smoothish. Alternately, you can use an immersion blender directly in the slow cooker but be sure to not blend all of the soup if you want it to have a chunkier texture. Add the puree back into the slow cooker. Stir in the baby spinach and lemon juice. Cover the slow cooker, unplug it, and allow the ingredients to just hang out for 30 minutes or so until the spinach wilts down. Season with salt, pepper and curry powder to taste as desired. Thin with additional broth to desired consistency. Serve warm with whipped greek yogurt, fried pita bread, and tons of fresh herbs (parsley or cilantro) on top! This easy roasted tomato soup is MUCH better than the can and couldn’t be simpler — perfect for fresh garden tomatoes and herbs! This healthy soup is naturally gluten-free and vegetarian. You can easily skip out on the milk and cheese to make this a dairy-free, vegan recipe. by Ashley at The Recipe Rebel. Place in the blender and puree until smooth (you’ll want to leave the lid cracked slightly so the steam can escape). Serve immediately with some whole grain bread. 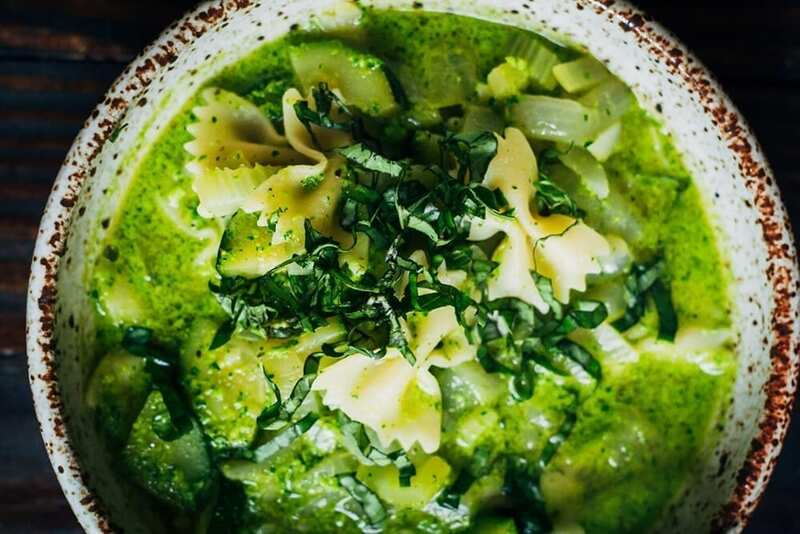 This green pesto vegetable soup is a celebration of spring and summer bounty, made with farm-fresh zucchini, fresh herbs, and pasta (use wholewheat or replace with a grain such as quinoa or millet, if preferred). Start by prepping the vegetables – chop the onion, zucchini, and celery. Then make the pesto – add all pesto ingredients into a food processor and process until everything is smooth. Or, for a chunkier pesto, process for less time. Add pesto to soup and stir well. Finally, add in cooked pasta – I used farfalle. If pasta isn’t your thing, feel free to add to add 2-3 cups cooked rice or any other grain, like millet or quinoa. Serve in bowls and garnish with fresh herbs. 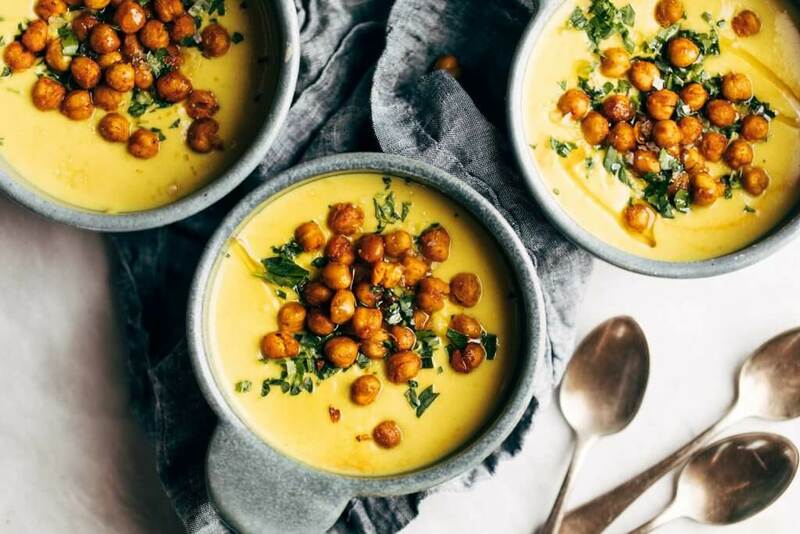 Cozy, bright, and healing with power-foods like turmeric, cauliflower, and cashews. Topped with crispy chickpeas. Super creamy and SO GOOD. by Lindsay at Pinch of Yum. Simmer: Add the water (I usually start with 4 cups) and salt. Simmer until softened. Finish: Return to the soup pot and add any additional water (remaining 2-3 cups) if you need to thin it out. Also a good time to season with more salt and a squeeze of lemon juice. Also a good time to top with spiced chickpeas and parsley and olive oil and more salt and put on your most comfy sweater and FALL IN LOVE. Turmeric: Turmeric has a strong flavour, so if you’ve never tried it before and you’re not sure you will like it, I would suggest using 1-2 teaspoons to start. If you’re a confident turmeric user, go for the full 1 tablespoon! Blender Stains: Depending on your blender, this soup can leave a stain from the turmeric. If this happens, we recommend leaving your blender sitting in a window in the sun for a day or two which will help get rid of the stains! Here at the School of Natural Health Sciences we offer a wide variety of nutrition-based courses, all of which are accredited in 26 countries worldwide. Our courses are not just for Holistic Therapists who want to add more to their portfolio of services, they are also for individuals who want to learn more and apply that knowledge to their lives. If you’re interested in other topics aside form nutrition, do check out our A-Z Course listing – we offer over 60 Holistic Therapy Courses!